Nicola started out by mentioning that her intended audience when initially developing this talk was people already conducting user research. However, the advice and anecdotes she shared are useful for anyone who engages with users to develop or improve websites and services at the University. Nicola started out by discussing when you would use these techniques. We looked at the human centred design process we’re advocating for the University, how it aligns with the Design Council’s ‘Double Diamond’ model and the different types of user engagement that happen through the process of developing a digital service. Engagement with users in open dialogue is important throughout, but particularly when a potential produce or service is being considered, and when appraising existing services. 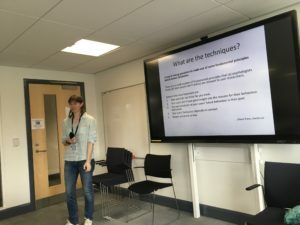 “A way of asking questions to make use of some fundamental principles about human behaviour.” There are some principles of human behaviour which psychologists are aware of, and Nicola covered 5 principles which she thought were the most important. As a moderator of an interview or research session, Nicola suggested you need to think of yourself playing a number of roles. It’s not just about what you or your interview subject says. We all give away an awful lot in non-verbal clues. As a moderator, we must be mindful of non-verbal cues in the participant, like frowning or looking to the side or up. We must also be mindful of the non-verbal signals we give to our interviewee; things like nodding or ‘mm-hmming’. Nicola played a fascinating, funny and at the same time, painful-to-watch interview with film star John Cusack, which had been analysed by a psychologist. In expert hands, it was clear here that more communication happened through what he did than through what he said. Nicola closed her session with some top tips from Whitney Hess to illustrate how someone applies these principles in practice. Shhh. Even if it takes a moment and it gets a bit awkward. Give the participant time and don’t fill the silences. Nicola’s closing point was simple, but very powerful. I thought it was a great way to self appraise your own performance when moderating a user session. An interview is not a conversation. If you talk 50/50 then it’s a conversation. An interview should be more like 10/90. For a bit of audience participation, Nicola then took us through an exercise which I had brought back from this year’s UX Scotland. Everyone got a bingo card filled with interviewer mistakes. We then watched a couple of videos and tried to check off all the bad practice we observed. If you’d like to find out more or bring the UX Service onboard to help you better understand your users, get in touch.